I was distressed at the development that has covered the Langley and Surrey parts of the Fraser Valley with over-sized apartment blocks and shopping malls. I had no time to take photos neither of the new construction nor the bits of natural landscape that remain. I must say that it is not primary landscape. Already in this past century and a half, settlers came, took down the forests and cleared the land for farming. It is fertile delta soil, wonderful for food production and dairy farming. But progress must ever win out. Currently, progress is taking the form of concretization. 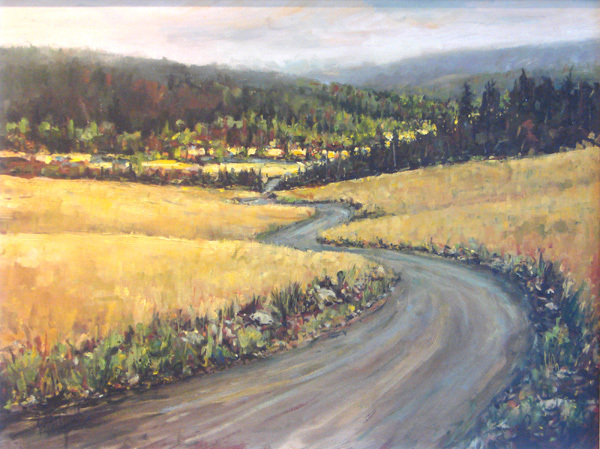 I link this thought with the paintings of Kim Pollard and her exhibition, Landscapes of British Columbia, now showing at the Fort Gallery, because Pollard is capturing the landscape in oil on canvas the way it was until recently, in vast tracts, in the Fraser Valley. She captures the vagaries of shifting light and atmosphere. 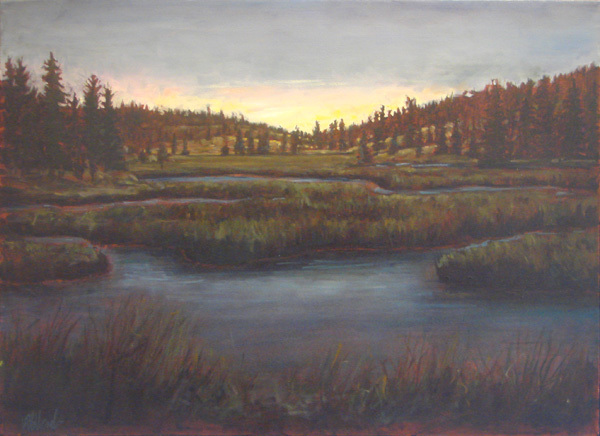 She captures the undulating hills and the colours of the vegetation – the grasses, the fields, the coniferous firs and cedars, the marshy waterways, the raised dikes to hold the tides at bay. Yes, the tides. The rivers and marshes are affected by the tides of the Pacific Ocean right up to Mission. Ocean liners go right up to New Westminster on the Fraser River. Waters in the sloughs, river-fed marshes and streams rise and fall daily to the pull of the moon. 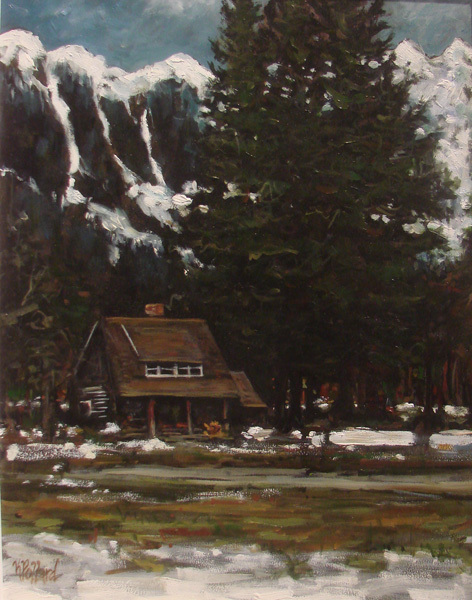 Aubades, 18×24, oil on canvas, Aspen Grove, B.C. 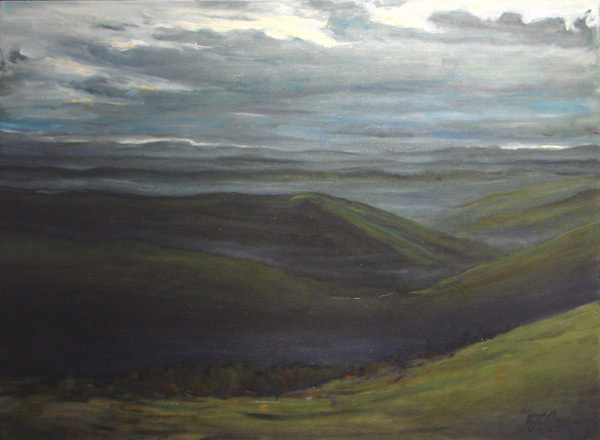 These are lovely paintings, as you can see, capturing the moods and atmosphere of the landscape. 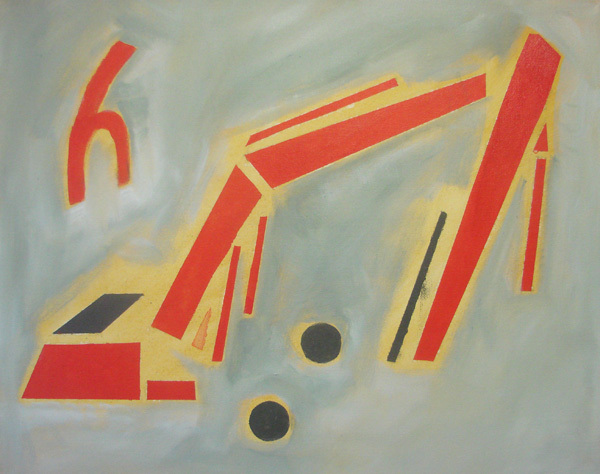 They are painted quite directly and her colour sense is attuned to the subject matter she sees, with subtlety. I especially liked the farmhouse painting where she captures the impressive height of our steep Coastal Mountains that encircle the valley , dwarfing the dwellings. The melting snow feels so tangible, painted in her vigorous manner, just as it is. The other thing I like about Pollard’s work is that each painting has a different composition from the next. It makes for an interesting exhibition because there is something to discover in each painting , while the style remains consistent. These are very livable paintings. You could hang them on your wall and find something new to meditate on every day. 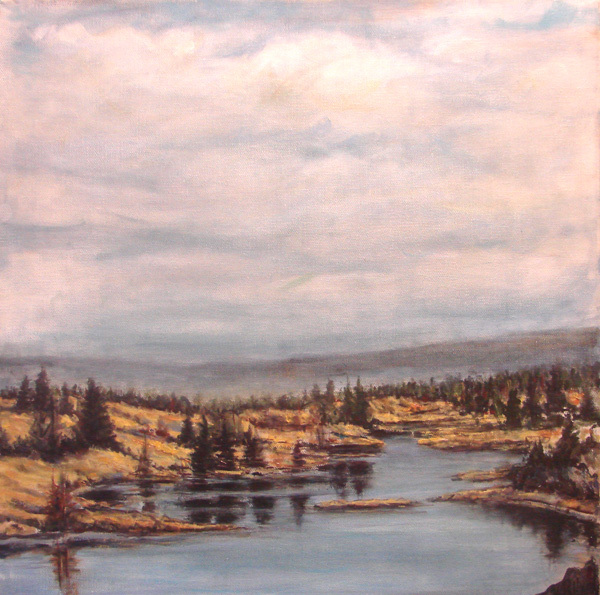 These can be seen at the Fort Gallery, 9048 Glover Road in Fort Langley , B.C. until January 31st and the gallery is open from noon to five, Wednesday to Sunday. Come see them. They are always better real than in photographs. And check out her web site for a whole new set of paintings. I’m back doing my construction work. Here’s a series of images that culminate in my most recent work. I must say that I’m not 100% sure it’s finished. I’ll have to let it sit for a while, but on the other hand, what I have been waiting for has occurred. I’ve been waiting for a flow of ideas to come. I’ve been waiting for that blessed artistic state where one idea builds on another, where the ideas come as I am painting. I can’t say that they are tumbling out, but at least they are coming faster than I can get them down on canvas, and I’m preparing canvases during drying time so that there will be another one ready for the next image. 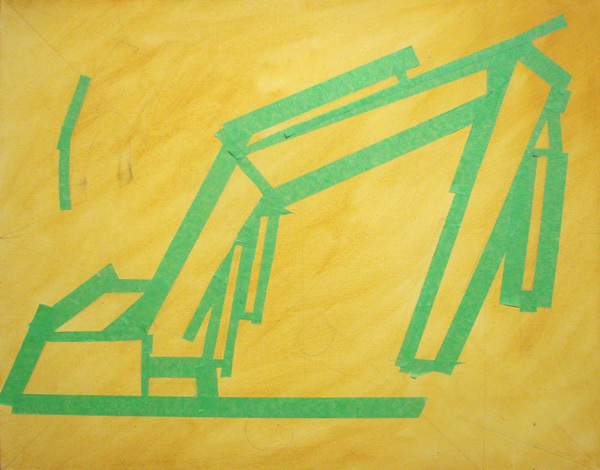 This first image is the underpainting with painter’s tape masking the edges. It helps get sharp lines when you are a traditionally messy painter.That’s the prep stage. I’ve established the two positive colours and shapes geometrically. Some of this is painted in masked areas, but the black circles, I didn’t have the patience or maybe the ability, to cut a perfect circle, so I just painted it free hand, if you can call it that when you painstakingly try to ensure you do not go outside the lines. Talk about colouring book technique! And then, third stage, I take off all the tape and see about the balance. Essentially I have composed this image relying on the spatial relationship theory of composition but I’ve also very faintly lined up the geometric relationships as well and have taken some of the key lines into consideration when I considered placement of the geometric figures. Like those puzzles where you connect the dots, your imagination can make synaptic leaps to reconstruct the digger. It has all the essential elements. But I’m not sure that I want a yellow background in this. I’d prefer a neutral grey – a light one. So I went about trying to mix a large quantity of the neutral grey dark that I used in the previous painting which focused on shapes. Impossible. In some additions of paint, it looks green, in others it looks brown. I add a bit of this, a bit of that. It’s not working. Finally I decide to go with what I’ve got. I add a lump of yellow ochre to warm it up and it’s not bad. Not perfect, but acceptably neutral. I start to paint and a funny thing starts to happen. As I am painting, getting up close to the red, the paint colour perceived as neutral starts to become an eye popping lime green. I can hardly paint as the effect of simultaneous contrast starts to play. I get this halo shimmering on the edge, and I can no longer see where the edge is as the eye refuses to compute the two adjacent colours together. I must say this is probably the hardest painting I’ve done since, as I’m painting, the edges are starting to move. And no, I haven’t eaten anything funny! It’s difficult and amusing at the same time. I’m tempted to keep the yellow underpainting in some spots and then decide that I will complete the grey background throughout. 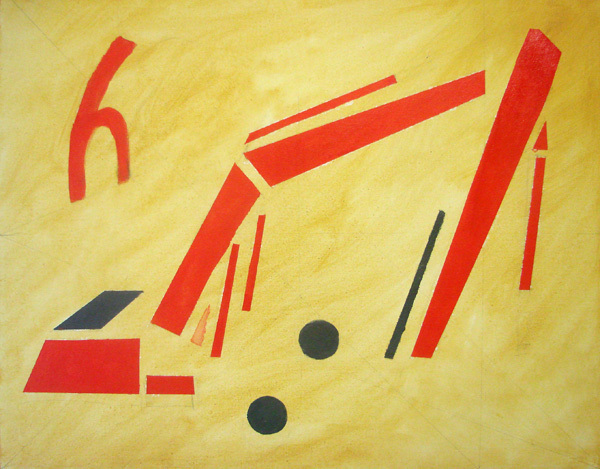 By evening, I have covered the entire painting in the grey, leaving only these red and black shapes of the digger, but it’s not even. I was hoping to escape having to mask off all my red and black shapes, but I’m out of luck. When I simply paint around without the mask, I get these halos of scumbled paint. Scumbling is a method of using your brush on its side with the flat of the bristles, not the point, which de facto give you a textured, messy kind of texture also called scumbling. I get a call from Mrs. Stepford to come over with the new creation and I go, toting a big green plastic bag with the painting in it and a book on mandalas that I got in some second hand or thrift store. I’m going to give it to Mrs. Stepford because she has just created a school program for all grades that is based on making mandalas. The green plastic bag is a necessity because it’s Wet Coast pouring rain. Her two painting students are there on the point of leaving, and Mr. Stepford is hanging in there, signing off his latest stunning photograph which he is giving to the two women. Mrs. commands me to bring out the new painting and we all discuss its merits. I make apology for the scumbling and the halos, but both Mr. and Mrs. rave over the scumbling. “Dont change a thing!” she exhorts. “I agree!” adds Mr. Stepford. They like the texture and think it would not be improved if I flattened the background to a single tone and hue. I promise to put it away for a few weeks before I do anything more to it. I had another vision in mind, but I can still try my other vision on another canvas and keep this one. So here it is at its final stage (for now). Every little change becomes an artistic decision. 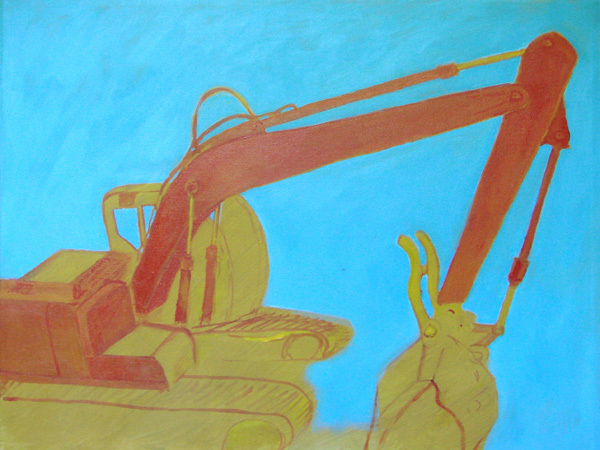 The Hitachi digger has been up on my wall in all its garish glory, an intense cerulean sky, a cadmium red light digger cut with some cad yellow. It’s eye-popping. It’s an under-painting. It’s too hard on the eyes with the simultaneous contrast operating at full force, But where to go next with it? What did I want to do with this one when I set out? After several months, I’m still stuck, looking at this rather blatant drawing in colour, not knowing what to do. Every change in colour shifts the balance, creates new values of weight. When the gallery dealer came, he had some wry comment about it, then praised the one in greys for its subtleties. Has this influenced my decision to add some grey? And if some grey, then how shall I mix that grey? I pulled out my painting supplies that had been hidden under the studio table and set up to work in acrylics again. Everything had been put away for the Christmas festivities. I’ve accumulated some supplies from garage sales and demos at economical cost. The tubes need to be used up; so I started with a Stevenson’s Burnt Sienna and some Manganese Blue but the mixture turns out looking too green a grey. Greys are the hardest to mix because they are so affected by the colour you put them beside. I had a lump of left-over white from my palette the last time I painted which I kept in a tiny jam jar with a skim of water for just this kind of mixing. If you put a neutral grey beside some red paint, it will take on a green cast; and if you put a neutral grey beside blue paint, it will take on a yellow cast to it; so the mixing has to take this into account. It alway takes on the cast of the colour opposite from it on the colour wheel. It may look perfect on the palette, but you place it beside something else and the colour shifts! Armed with this grey mixture, and lots of it – one doesn’t want to run out mid way and have to remix some paint; it would be impossible to match – I painted in some of the digger parts in dark grey trying to maintain the fine red lines that were the first definitions on this image of the location of the various parts of the machine. Here it is with the first grey put in. It has become heavier at the bottom with the grey and not the ochre. It was insubstantial, floating in the air before, and now it is grounded. I had to chastise myself as I started to make this painting more and more realistic. I struggled against my own nature when I force myself to abandon the detail and search for the major shapes. I was tempted to use all four colours and then realized that I was tripping down the realism path again. The only purpose of the yellow undercoat is to warm the painting from below. In the end, I used the three major colours and ended up with this. We discussed the ambiguity of the sky colour and the lack of a definite ground or horizon line. We discussed the weight of the dark colour massing at the bottom and whether or not it adversely affected the overall imagery. I went home to struggle with it a bit more. One of my wandering thoughts was “why do I say that I want to do fresher looking paintings, more direct and then keep on tidying up everything until it no longer looks free but belaboured”. What is the fine line between free and sloppy? What is the defining criteria between child-like and childish? How far can one push it before realism becomes interpretation? Or becomes abstraction? I was plowing through the borders of these things without any answers. 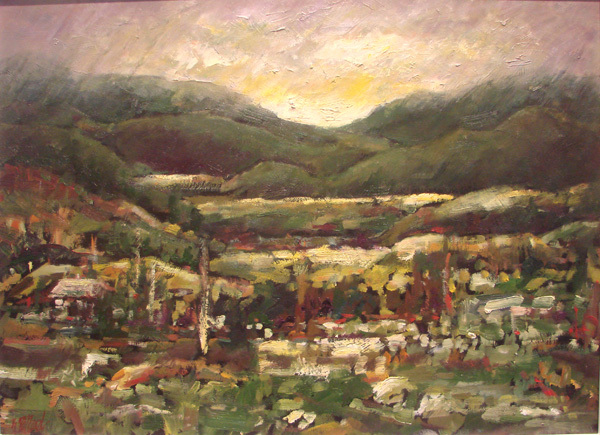 I was remembering one of the very elegantly painted works of Kai Althoff whom I wrote about quite some time back. One of the paintings had this simplicity of shape, but his paint was impeccably even and his lines were equally wide throughout. It seemed almost as if it had been printed, but it wasn’t. It was hand done, but so perfect. Mine’s not perfect. The lines are varying in width and sometimes thickly, sometimes thinly painted. They vary from deep cadmium red to cadmium yellow. Could I just leave it like that? My shape colours are not flat and even. I’ve allowed the underpainting to show through. I like that because it gives a bit of texture and the paint sometimes glows with the undercolour peeking through. And yes, I can do that. To leave it thus is an artistic decision. And this is where I have left it. I’ll sit with this version now and see in a week or two if I can live with the work as it is, to date. Next, I start with this underpainting and second draft of a visual idea. It’s about metamorphosis. 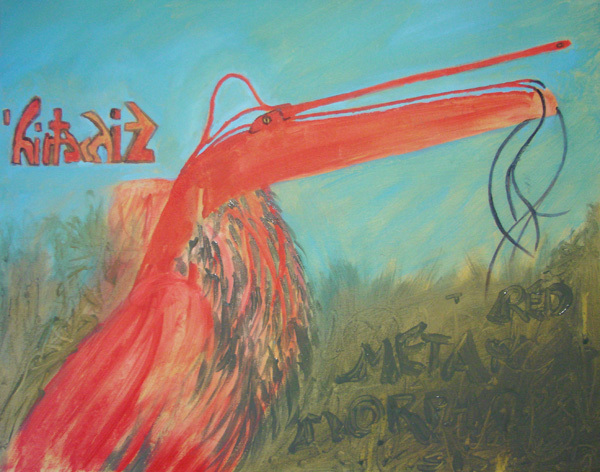 I found that the digger looked quite like a heron with a long red beak and the cables much like river grasses. At this stage, the colours are too flat, too transparent, too much like first draft. There’s no refinement. 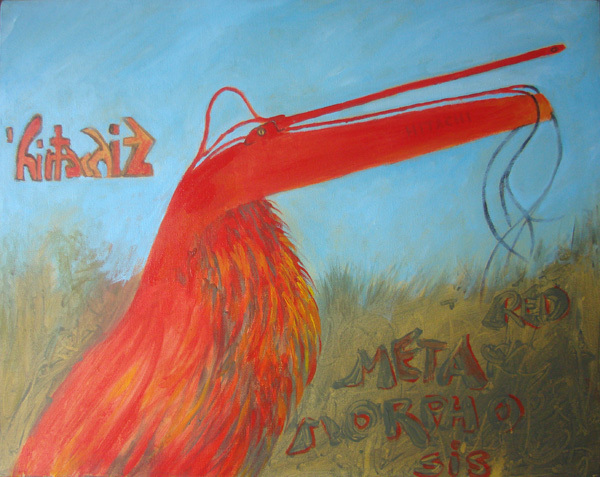 I worked at building up the reds, giving the breast of the bird a better shape through modeling it in different tones of red and yellow and this grey which is left over from the previous painting. I think it’s important to carry over colours or use a limited palette. It ties a group of paintings together. 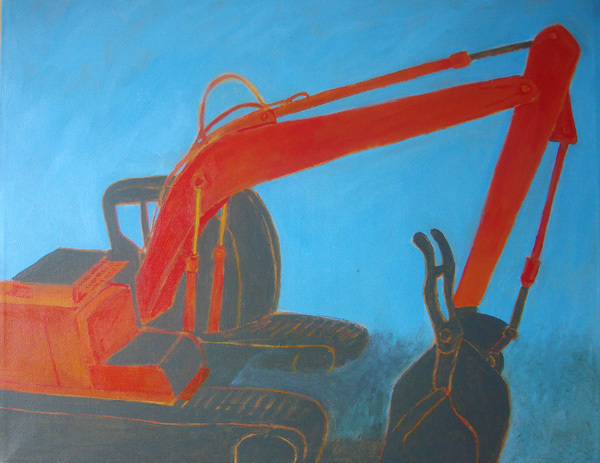 There is an unfortunate shape of red behind the Red Crested Digger. 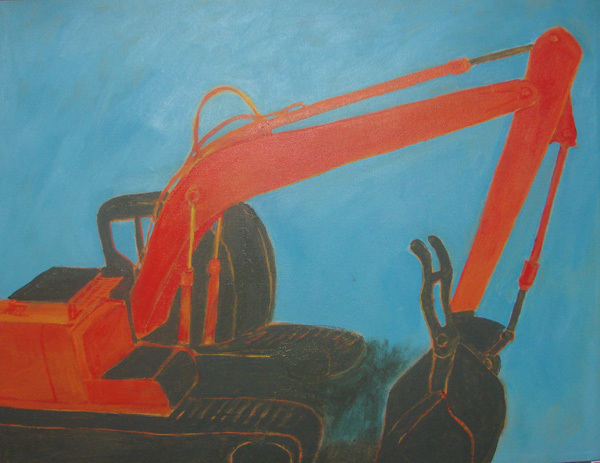 It was originally from the cab shape of the digger. Now I want to obliterate it. In doing so, I lose all traces of warmth coming from the underpainting, and the cerulean blue mix that I use to overpaint is a shift from the previous cerulean and titanium white. The whole sky has to be repainted, otherwise the patch will stick out like a sore thumb, but it’s a good trade-off for the overall compositions of the painting. I’m pleased with that change. And now, the series is beginning to come clear to me. 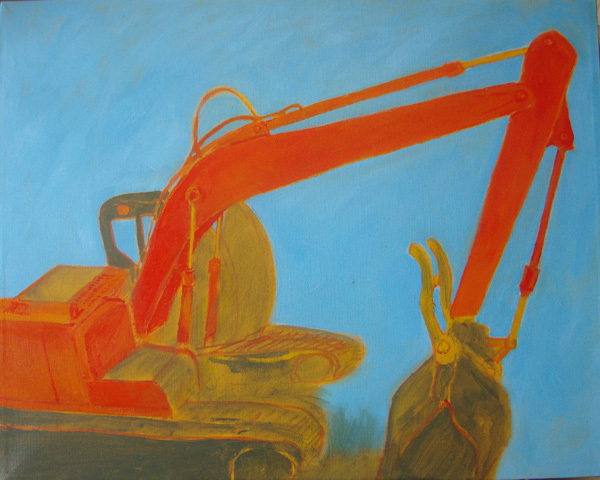 In each painting I am exploring not only the visual reality of the digger but the abstract qualities that drew me to it. And from that, there are new ideas coming to me. This one is about metamorphosis and in graffiti like letters, I spell out that clue in the foreground while the Hitachi graffiti graces the cerulean sky. These markings provide balance. 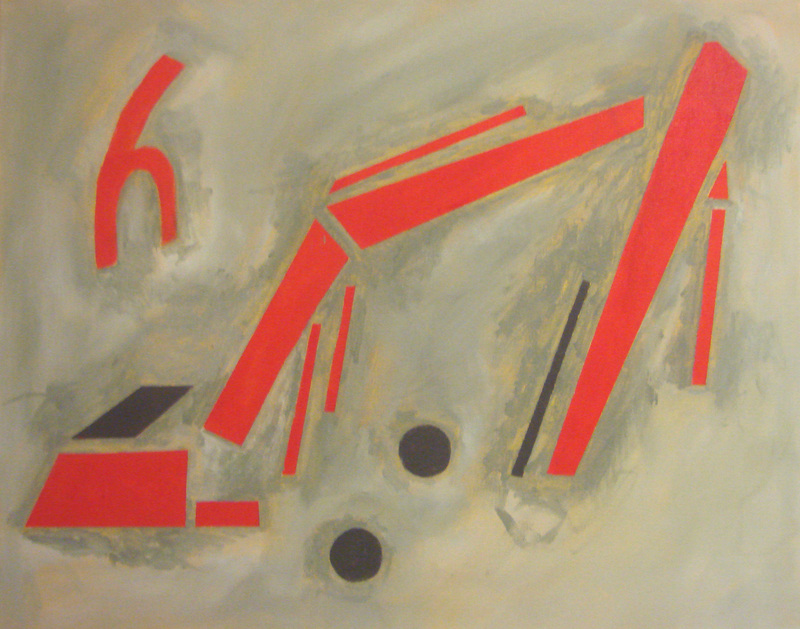 In the final version, below, I have added red into letters of the grey foreground. It helps pull the eye into the remainder of the picture and brings more warmth into the image. 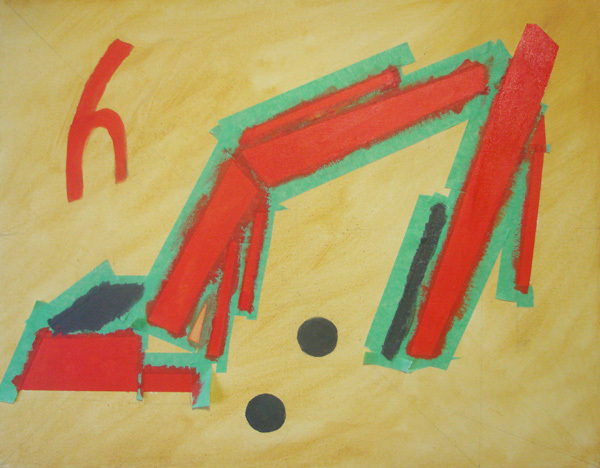 It has already given me an idea, even more abstact for the next stage – not on this painting. It’s done. I’m ready to start a new one! You are currently browsing the ars longa; vita brevis blog archives for January, 2010.